Lamai and Hua Thanon are the main coastal towns in East Samui. The former may be known for its party scene, but beyond its late-night revelry, Lamai also offers family-friendly attractions, excellent beachfront dining, luxury spa experiences. About 10 minutes’ drive away is Hua Thanon, a quiet coastal town. While the town doesn’t offer much in terms of attractions, its remoteness is what draws vacationers towards residing at this part of the island. It’s also within driving distance to local amenities and popular travel attractions. Spend quality time with friends and family at Lamai Beach. This ultra-popular venue is a hit with sunseekers, and boasts stunning sunrise views. Seeking a getaway from the crowds? Head out to Bang Kao Beach, where a scenic white sand coast stretches out towards cultural attractions like Laem Sor Pagoda and Khao Chedi. Do note that the sea conditions here aren’t suitable for swimming. About 30 minutes’ drive from Lamai is Taling Ngam Beach, a quiet venue with beautiful sunsets and untouched nature. When you’re not lounging by the coast or enjoying beach strolls, check out attractions like Hin Ta and Hin Ya rocks, Wat Khunaram and Lamai Viewpoint. The latter offers uninterrupted views over Lamai Beach, great photo-taking opportunities and a zipline ride over the jungles. Try your hand at cooking Thai dishes at Lamai Thai Cooking School, or unwinding with spa rituals at the luxurious Tamarind Springs. 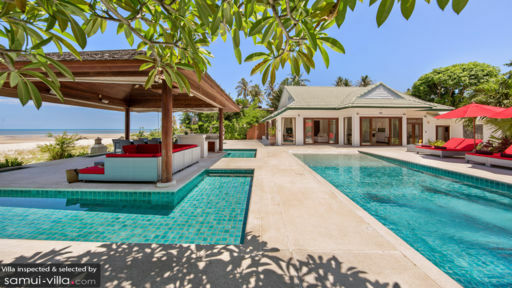 Yoga classes are available at Yoga House & Spa, and in-villa sessions may be arranged with the instructors if you prefer the setting of a one-to-one class. From organic cafes to waterfront restaurants, East Samui has no lack of dining options. Beach Republic Ocean Club offers a modern setting perfect for lazy poolside dining and brunches. The Bistro at Rocky's Boutique Resort is a great bet for romantic dinners by the sea, while Thong krut Fisherman’s Village offers a good selection of seafood restaurants. In Hua Thanon, there’s Sweet Sisters Cafe, a cosy venue known for its wholesome organic fare. 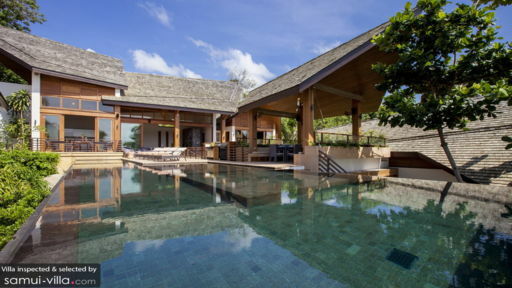 Or stay in for an in-villa dining experience, where you’ll tuck into a meal prepared by a private chef. There’s the option of customising your menu, so do check in with your villa manager about this. Samui is a destination that lends itself to day trips, as most attractions are within 30 minutes’ to an hour’s drive from your villa. Your villa manager will assist with the details, so feel free to reach out, whether it’s about planning your itinerary or getting vehicle rental. For a start, we’d like to recommend visiting the iconic Big Buddha and Wat Plai Laem (it’s 15 minutes’ walk from the Big Buddha), trying out kitesurfing and hopping off on a speedboat to visit the offshore islands of the Ang Thong Marine Park.